Would you like to create your own brand for retail? Or would you like to bring a product onto the market but lack the capacity and technical facilities to produce it yourself? Or would you simply like to outsource production for business reasons? No problem! At RUF, we are specialists in creating your own brand (private label) or contract production. With modern mixing and packing facilities, specialist staff and certified processes, we create your own-brand products and implement your ideas quickly and reliably. Based on our many years of international industry experience and the specialist expertise we have gathered as a result, we are constantly working with our clients to develop new products. Our experts provide you with individual advice and react quickly and flexibly to your needs. Our products in the dried desserts, baking ingredients, baking mixes, decorations and sweet dishes categories are of the highest quality. In our internal research and development department, we lay the foundations for innovation. This is where our staff come up with recipes for our own brand as well as your individual product, based on your specifications and with one eye on the latest trends and market developments. We can develop a private label product concept completely tailormade for you. However, our tried-and-tested products from our extensive product range for own brands are also available. We guarantee you the best results through the right mix of high-quality ingredients, tasty flavours and meeting your own specific requirements. From procurement and design to printing – we know how to showcase your products. We provide a wide range of alternative options for packing your brand products. You can choose from small sachets, different cups and pouches or folding boxes as desired. We also work with you to produce tailormade packaging solutions – up to large containers holding 25 kg. We use modern production technology to produce our products – after all, when it comes to quality, we never compromise. Key stations in the production process are strictly monitored to ensure that only raw materials which have been inspected are used and processed. Our audited quality control system ensures seamless tracking – from raw material procurement to the finished product on the shelves. Attracting attention plays a major role in presenting promotional products. We are happy to create individual sales displays, mixed displays or mixed boxes for you. We arrange the layout and placement based on your specifications. Working with our capable partners, we supply the finished articles to the preferred destination – whether that’s a central depot or straight to the point of sale (POS). 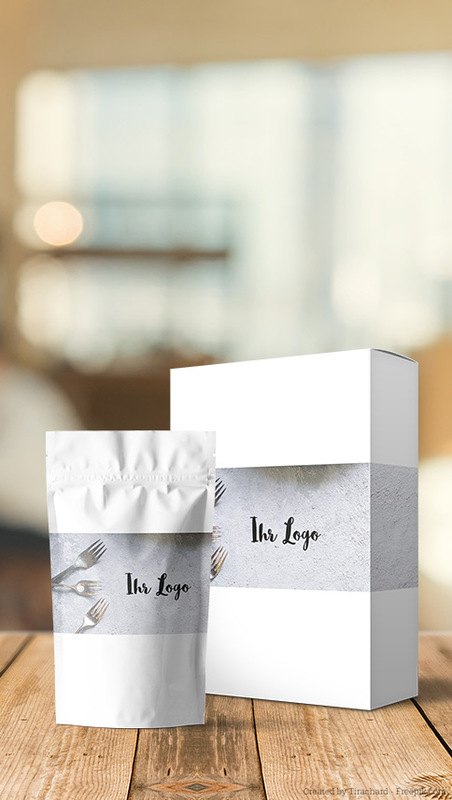 We offer a range of packaging options to show your retail brand in the right light. At the end of the day, only one thing counts: your success. Find out more about our packaging options on the following page. Whether it’s in Quakenbrück or Essen (Oldenburg), we have implemented extensive quality management at both of our production sites. Annual International Featured Standard Food (IFS Food) and Global Standard for Food Safety (BRC) audits consistently back our quality management. For various products and procedures, we are also authorised for production in line with organic, kosher and vegan requirements. Got a query about creating your own private label? We can offer you tailored advice. Seasonal promotions to boost sales, such as Christmas, Easter, Halloween or your own themed promotions. Would you like to sell your private label (retail brand) abroad, too? No problem! With many years’ experience on the international scene, we know the requirements for food products in different countries. We are also able to adapt the tastes and preferences of different countries and incorporate them into our development process in order to supply the right product for every market. Our export team is happy to help with all your key queries regarding overseas sales. We’ve got the right contact for you!